Elevator maker Kone recently opened one of the tallest elevator test towers in the world. The 36-story tower is located at the Kone Park manufacturing site, engineering facility, and research and development center in the Kunshan New and Hi-Tech Industrial Development Zone in China. The tower contains 12 elevator shafts reaching 235.6 meters high. They can be reconfigured to test new high-rise elevators and components. The Kunshan tower is the tallest of Kone’s eight testing facilities spread around the world. Its underground testing facility in Tytyri, Finland is 305 meters deep. It allows Kone to test elevators at speeds up to 17 meters per second, which is not possible anywhere else. The maximum speed at the Kunshan tower is 15 meters per second. The tower also contains several permanent features. A high-speed elevator transports visitors to a sky lobby and showroom at a speed of 10 meters per second. It is the first double-decker elevator in the world to use Kone UltraRope super-light cable. 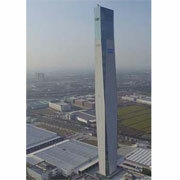 Kone developed the tower to promote research and development in mid- and high-rise elevator technology. The company hopes to further strengthen its position in the Chinese elevator market and deliver new products faster. The R&D team in Kunshan works closely with researchers in Finland. The new tower is expected to bring the two units closer together and help them better serve the European and Asian markets. Kone began operating in China in 1996. The Kone Park in Kunshan was opened in 2013 and is now Kone’s largest manufacturing unit in the world. Kone employs over 13,000 people at 500 locations throughout China. It is a leader in China in terms of new elevator and escalator orders.